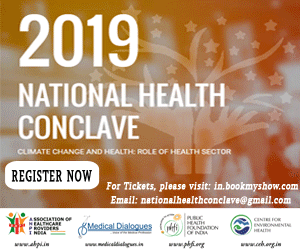 New Delhi : In a first move to create awareness about the connection between climate change and healthcare sector and how they impact each other the Association of Healthcare Providers of India (AHPI) in association with the Public Health Foundation of India (PHFI) recently organized national health conclave on 23rd March 2019 in New Delhi. Stakeholders of different fields including doctors, scientists, politicians, and among others came together to discuss some of the crucial issues like the use of plastics by doctors and how medical professionals are not aware that a central line insertion can aid plastic pollution. Moreover, the event saw discussions on how Biomedical Waste Management is often overlooked by health professionals which can catastrophically increase the pollution aiding to climate change. The conclave was also an initiative to caution the health care sector about emerging diseases due to the rise in the temperature and to advice the healthcare community to adopt a sustainable infrastructure to combat climate change and natural disasters. The conclave saw the release of a white paper signed by the esteemed dignitaries and CEO of more than 50 hospital. The white paper aims to summarise the available evidence on interlinkages between climate change, air pollution, associated health impacts and the critical role of the health sector as a contributor as well as a first responder to climate change. The white paper will now be submitted to the government. The conclave event was closed with the mesmerizing performance of Grammy award-winning composer, music producer, and environmentalist, Mr. Ricky Kej. FIRST AND FOREMOST THE GOVERNMENT SHOULD STOP TREATING AIIMS NEW DELHI , PGI CHANDIGARH, BY PUMPING TRUCK LOADS OF MONEY . IT IS GIVE EQUAL OPPORTUNITIES TO OTHER MEDICAL COLLEGES ALSO. THE STEP MOTHERLY ATTITUDE TOWARDS OTHER MEDICAL COLLEGES SHOULD END IMMEDIATELY.